2005 Chevy Express 1500 van, 5.3 L, V8 - The perfect tow vehicle for rvsue and her canine crew! It’s perfectly clean inside and out. You ride “high, wide and handsome” as my Dad used to say. There’s a bench seat behind the front seats for the canine crew to sit on and look out the window, plus — an important selling point — there’s rear air to keep them cool. I’m glad it has tinted windows, too. You know how things can start clanging in the back of a cargo van? Metal against metal, so maddening, and sometimes it seems impossible to stop it. This van is fully upholstered throughout which means no clanging. I suppose it will add some insulation, too. The floor is not carpeted — another plus. It’s got a rubber/vinyl/whatever mat, meaning I don’t have to worry about doggie footprints, desert sand, or back roads mud! Ok, so it’s not the most stylish vehicle on the road today. It’s a boxy, white van. It looks like I’m going to be fixing air conditioners or hauling girl scouts to camp. I know, I know. But I love it!!! It is so practical. I love things that are functional without a lot of foo-foo. So it’s not a Jeep. I’m over it. Now here’s the hard part for me. I promised I would share my expenses with you. You know, I don’t normally share anything with anybody. At least not personal finances. Dickering over price is not in my skill set, but I think I did okay. I paid $8, 500 for a 2005 Chevy Express. Okay? Now don’t make me feel bad by telling me about a better deal you got. Anyway, I haven’t told you about another really cool feature it has…. which is my cliffhanger for today! Happy Easter! A great day for a new start! Can you believe Bridget has to be lifted into the new van? What a big baby. This entry was posted in Simple living and tagged RV, Tow vehicle, Travel, van. Bookmark the permalink. Cheers back at you! I just took a look at your new blog. Great header! Great start! Sounds like you have a plan and a good attitude. I travel in my 96, 28′ Allegro class A. Just sold my house and I am waiting for the papers to pass so I can get on the road to adventure …..
Kay, Good for you! Congratulations! Another adventure begins…. I’m leaving for work now but I’ll be sure to visit your blog this evening. Thanks in advance for following along with me as I will with you. Kudos to you… sounds like this will be a blog I’ll enjoy following. Love the photos of your furbabies – let us know how they do on the road, along with any special accommodations you may have to make for them to be comfortable. Thanks Debbie! Yes, I plan to give readers a picture of what it is like to live with two terriers on the road (not pretty). I’m going to have to be very inventive to keep us from being “shown the highway” by campground hosts! Glad you like the photos. I haven’t figured out how to place photos between paragraphs. I get them placed in my draft and then when I publish, they move to the top. So frustrating. I’m new to WordPress. Bear with me… I’m going to keep a Can-Do attitude! I love the van!! It looks perfect. I am really getting excited for you. Going to let our CCS Friends know about this blog. You always could write and I am so looking forward to going on the adventure with you through this blog. Love you so much, my dear Sister! Thanks, Pauline! It really makes the effort of writing the blog a lot of fun when you hear from people who like reading it. When I get on the road and I’m living fulltime in my little Casita, I hope to make several entries every day. Thanks for getting the word out that the crew and I are here. I love you, too, big Sis! So glad I found your blog! I’m ready to chuck it all and hit the road. Look forward to hearing about your journey! I hope my blog is helpful, Pat… I’m glad you’ll be following me and the crew down the road! I have a 1996 LD Casita and use a Toyota minivan to tow it, but I’m looking for a full size van in a year or so. Your deal looks really good to me……..and they are practical and efficient for towing. Good choice, and best of luck in your travels. 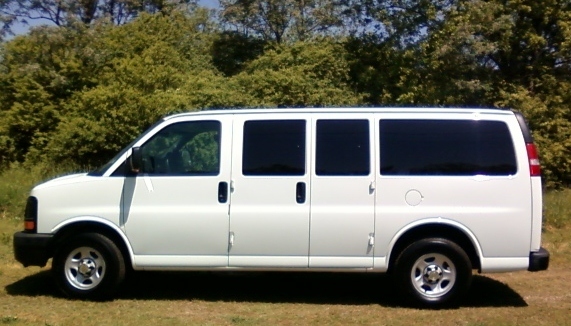 Tom, My new van replaces my minivan (Honda Odyssey) and I ordered the LD Casita… sounds like we’re of like minds! Once I saw the space inside these full size vans I knew I had to have one. A friend of mine, when he saw the interior, said, “Man, this looks like a house in here!” I drove mine to work today and was so pleased with how comfortable it was, not like the vans of the olden days.